Last week I acquired a 30's vintage National 56 MC transceiver. Read about this model on my web site at http://www.prismnet.com/~nielw/TRM_TRW/TRMpage.htm . 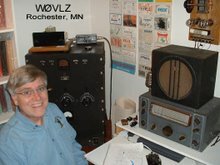 The TRM and the wooden cased TRW were two of the first commercially available VHF radios. At only 6"x6"x7.5" and 8.5 pounds it is amazingly heavy for it's size. The two special National transformers add a lot to the weight. I don't find much information about the TRM. What I've found is from National's 1935 catalog and a 1933 article that, while it doesn't mention it by name, appears to describe the TRM. None of my catalogs mention the TRM or TRW after 1935 but my TRM has a model tag. National didn't but tags on their equipment until after James Millen left in 1938. This one must be a late model. Here's something that I keep around to show visitors that hams really did build the transmitters described in QST. Take a look at my version of George Grammer's push-pull TNT transmitter. This one here is a lot worse for wear but it is recognizable. Every once and a while over the years I've picked an item at a swapmeet just because it was interesting and if it could talk would have a story to share. Here's one. I don't remember when or where I got it but probably at a central Texas swapmeet a few years ago. Some one on a budget wanted to get into ham radio. The local trash heap contributed an old crystal set complete with loose coupler . The tuning coil was rewound as the antenna transformer primary. Some tuning was allowed by striping off insulation in a few places. The loose coupler became the antenna coil and allowed variable coupling. I found a section of the Sunday comics shoved into the loose coupler to keep it in place..date1930. Two of the holes on the board next to the spark coil match the mounting holes for a Bunnell telegraph key. A push-pull amplifier is two tuning caps, two coils and two tubes right? With all of the support circuitry, the output loading circuit I like and miscellaneous parts and hardware it is starting to look like a real project. Once the drilling is done this one will sit until warm weather returns to Minnesota (maybe May?). I want to paint the chassis but not with snow on the ground and temperatures in the 30s.